Assist in the coordination of the day-to-day operations of the Township Assessor’s Office including mass appraisal of all property subject to valuation. The ideal candidate would have the ability to calculate figures and amounts such as reductions, proportions, percentages, area, circumference, and advanced statistical analysis; apply concepts of basic algebra and geometry; calculate figures and amounts using fractions, decimals, and percentages; set up high level spreadsheet formulas. Assist the Board of Review. Appraise all property subject to valuation. Measurement and inspection of all buildings subject to taxation. Read and understand legal descriptions. Read construction plans and specifications. Utilize statistical information to establish valuations and assure equity of valuations. Effectively communicate in writing and verbally. Receive and respond to inquiries and complaints from property owners by explaining how property values were established and informing property owners of appeal procedure. Update Assessor files and records to reflect the outcome of property assessments and to ensure the addition of new construction to assessment rolls. Prepare and testify in local Board of Review hearings and Property Tax Appeal Board hearings as to accuracy of valuations. Knowledge of Geographic Information Systems (GIS). Assist other local government entities as necessary. Determination of exemption eligibility and administration of any forms required. Perform related duties as required. Four-year college degree or HS graduate/equivalent plus experience in appraisals, assessments, construction or real estate. Knowledge of real estate terminology and instruments of transfer. Ability to calculate figures and amounts such as reductions, proportions, percentages, area, circumference, and advanced statistical analysis; apply concepts of basic algebra and geometry; calculate figures and amounts using fractions, decimals, and percentages; set up high level spreadsheet formulas. Ability to analyze factors relating to the appraisal of property. Ability to read and follow land descriptions, plats, mortgages and contracts. Ability to establish effective working relationships with co-workers, real estate agents, and the general public. Ability to maintain records, gather data and prepare appraisal reports. Knowledge of laws pertaining to assessment of property and laws pertaining to tax exemption. Knowledge of socio-economic conditions and trends affecting property appraisal. Knowledge of rights of taxpayers and property owners/public relation principles. Knowledge of local government practices for assessing purposes. Knowledge of supervisory principles, practices and techniques. Ability to work as a team or independently as needed. Ability to represent the office in an honest, trustworthy, polite and professional capacity. 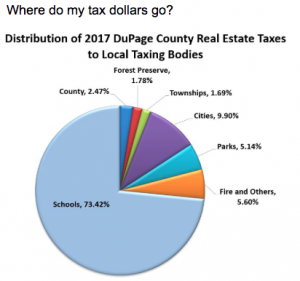 Familiarity with the following: Microsoft Window 10 or higher, Microsoft Office, Mac OS 10.x or higher, Mac Office applications, FileMaker Pro, AssessorsIMS CAMA-system, Apex drawing software, databases specific to DuPage County and Internet. Ability to use telephone, facsimile machine, copy machine, printers, scanning devices, calculator and general office equipment. While performing the duties of the job, the employee may be required to sit or stand for extended periods of time, to reach with hands and arms; stand, walk and use hands and fingers, to handle, feel or operate objects, tools or controls, including reaching and lifting objects up to 25 pounds. The employee is occasionally required to sit, climb, kneel, crouch, crawl, and balance on a step stool or small ladder to reach books and/or documents on shelving above the head. Specific vision abilities include close vision and distance vision and the ability to adjust focus so as to be able to review documents and text on the written page or electronic media. The employee must have the ability to hear clearly and understand normal conversation and the ability to speak clearly and distinctly. The noise level in the work environment is usually quiet in the office. Outside of the office volume levels can vary significantly. Duties are performed in an office and at property sites. Work at property sites is performed daily and typically involves standing, walking, and bending as required to measure and appraise properties. Work at property sites involves travel in normal seasonal weather and may involve exposure to hazards at building sites if reasonable caution is not exercised. The employee occasionally works in outside weather conditions and may be exposed to wet, humid, hot and/or cold conditions. May also include contact with angry and potentially dangerous people and animals. Please provide a list of references and previous work history. Please send resumes, references and work history to assessorjobs@dgtownship.com.